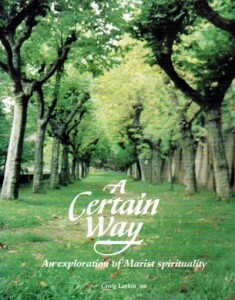 A Certain Way: An exploration of Marist Spirituality. There is a certain way of living the Gospel, the way Mary lived it and as understood by a group of people called Marists. Craig Larkin wrote this is the story of those men and women who last century committed themselves to what they called “The Work of Mary”, and began a movement which still thrives today. It is also the story of what makes today’s Marists think, judge and act. Over the years, many people have provided scholarly research into the origins and spirituality of the Marist project. Other people have added to this: young men and women, novices for the Marist religious life; men and women who live this way of life as married or single people; high school students who have somehow caught a glimpse of what this spirituality could mean for them. The book “A Certain Way” was first published in 1995 and it still proves to be popular. Rather than re-printing it, A Certain Way is now a Website. A Certain Way is about the “Work of Mary” is also the work of many. Much of its content has been gathered from sources which may not be easily accessible to people. There are extracts from serious monographs and scholarly studies. And there are shafts of insight provided by people who would never consider themselves scholars, and may be surprised to know their words are even quoted! A Certain Way is an unusual resource. On the one hand, it can be read as a continuous text. On the other hand, each topic is self-contained, and can be used as a single unit for reflection. The topic provides a commentary, while the rest gives further matter for reflection. So the ideas can be opened in any. In this way, you may be able to get a taste of this way of life in the Church.